JRMC Surgical Services offers both same-day and in-patient services. Approximately 1,500 surgeries and 1,300 endoscopic procedures are performed each year in the Surgery Center. 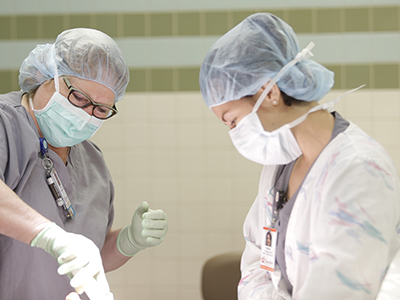 Highly skilled surgeons lead surgical teams that include nurse anesthetists, registered nurses and surgical technologists. Our medical staff offer multiple surgical specialties. JRMC is a leader in the region for the surgical services provided. The state-of-the-art rooms at JRMC are equipped with the latest, most advanced technology for patients to receive the best quality care. With three surgical suites and a fully equipped endoscopy suite, JRMC can schedule your surgery in a timely matter. General surgeons can help with various surgical needs, including those of the abdomen, breast, ears, tonsils, digestive tract and reproductive system. A colonoscopy is a test of the large intestine’s inner lining. Doctors use this test to detect ulcers, polyps, tumors or areas of inflammation and bleeding. The test can also detect cancer or precancerous growth. The American Cancer Society recommends most individuals over the age of 50 have a colonoscopy every 10 years. People at higher risk may need the screening more often.